Dear Father, speaking of sustained feelings, how do you translate, in the well-known Benediciton oration: tribue...ut redemptionis tuae fructum IUGITER SENTIAMUS ? And such phrases as sentire effectum, not to mention the word affectus which sometimes occurs? Does the Latin liturgy not value feelings? On reading this piece I felt my heart strangely warmed. Er, I can't speak for Anglican Evangelicals, having never actually met one. But among us Lutherans, faith is treated not as a feeling but as a human response to the objective fact of justifying grace delivered in baptism. Granted, this response may be include not only outward deeds but also inward dispositions, whence it is often (mistakenly) confused with one's awareness of salvation. But "faith" as we mean it, is not in its essence affective, nor it is subjective. The dirty little secret, far less secret after recent decades of dialogue, is that the word "faith" in Lutheran theology greatly exceeds its customary duty, and comes to mean something that is prior to, but part and parcel of, such ideas as "theosis" and even "sanctification." I, too, am baffled by defining fiducia as a feeling. That's just nonsensical. God promises that Jesus' life, death, and resurrection rectify the relationship between Man and God. He directly promises that that promise applies to me in my baptism. To which we say, Amen. And that is trust, fiducia, pistis. And what is the difference between fiducia and pistis/fides? Lutherans frequently divide this into fides qua creditur and fides quae creditur. That faith that believes is fiducia; that faith that is believed is fides. The first is founded upon the second, rests on it; the first is Spirit-wrought in the believer through the second which is Spirit-inspired in the Sacred Scriptures and summarized in the Creeds. Fr H., being naughty again and upsetting Lutherans I see! Didn't Bl John Henry give some talks about all this justification by faith stuff at a chapel near your church? Thanks for the Dix - I'd forgotten the passage. It reminds me of amusing things Knox wrote of enthusiasm. I think that Dix made the point that mediæval piety, imagining oneself at Calvary all during Mass, and pouring out prayers relative to that, was a great influence on the Reformers: they reduced Mass to what the lay folks' prayer guides made of it - a devout remembrance of Christ's Death once for all. Similarly with Luther finding the Verba as the Ark in the Temple of Dagon, discarding the Canon and its stench of oblation, keeping only the pure Gospel words of the Consecration - such a notion as only mediæval debates about the moment of Consecration could have encouraged. The idea of cutting up the Anaphora would have been senseless to the Greeks. It took Patristic scholarship amongst the Anglicans and Nonjurors to devise liturgies that put oblation back in and restored an Anglican Canon. Now, Joshua, the good father was not upsetting Lutherans. We simply did not and do not recognize our faith in the description that Dix gives. Oh, and not to side-track too far, but it is of interest perhaps that in the De Sacramentis anciently attributed to St. Ambrose, the writer notes that when the priest comes to the time to effect the consecration, the priest no longer uses his own words, but uses the Words of our Lord to consecrate the Sacrament. Not quite medieval. The notion is rather ancient, though of course St. Ambrose (or our unnamed author) would did not draw the conclusion that the remainder of the prayers were unimportant. At the risk of making myself unwelcome on the blog, I'd like to pick up another point that Dix is in error on in this citation: the notion that there is no actual change in the sinner. As to the distinction, see Heidelberg Catechism Q. 21: What is true faith? The theologian I have found who has written most clearly on the subject was French Reformed Prof. Auguste Lecerf, in his work translated into English: Introduction to Reformed Dogmatics. Of course, the St Ambrose reference is what you say it to be. I was merely taking up Dix's argument. I'm glad to see that the Lutheran confessions do teach a real change in the sinner (as indeed they do in the elements at the Eucharist) - but of course simul justus et peccator rears its ambiguous head in the former, just as "in, with and under" (what non-Lutherans call consubstantiation) in the latter case. I am reminded by this reference to ongoing dying to self - so correct and vital a theme - of an amusing tale of Fr Jean-Jacques Olier, founder of the Sulpicians: he used energetically to exhort his fellow priests to holiness at their daily chapter meetings, often crying "We must kill the old man!" I'm not sure what is ambiguous about the simul justus et peccator; it merely describes that from Baptism's beginning to its completion, we have a fight on our hands against the old man. Surely no Christian denies that such is the case. It was never a formula to excuse sin; it was always a formula meant to preserve us from despair as we struggle against sin. As to consubstantiation, no, we do not accept the term or the theory. The "in, with, and under" are nothing more than a way of putting what Pope Gelasius taught so clearly: "Certainly the sacraments of the body and blood of Christ are a divine thing, through which we are made partakers of the divine nature; and yet the substance or nature of bread and wine does not cease to be. – De duabis nature. In Chr. Adv. Eutych. Et Nestor. Patrology IV, 1:422 So we joyfully confess that the bread is our Lord's body and the wine His blood, but we decline in anyway to speculate on the how this comes to pass, other than asserting that it happens by the Holy Spirit through the words of Christ. From memory, the phrase simul justus et peccator is avoided by Catholics because, while as you have explained it it is unexceptionable, and indeed "the just man falls seven times a day" and - says Augustine - all the saints together would confess that they (on earth) were sinners (excluding for the Lord's sake His Holy Mother); yet the phrase can bear a nasty unorthodox meaning, as if one could be accounted justified and still remain inwardly unregenerate: the (in)famous image of the soul as a dung-heap covered with snow. Perhaps the term is misused more by Reformed persons? I've never quite got why Lutherans hate the term "consubstantiation" - I suppose it must be something that annoys, rather like naive persons saying to Catholics "You worship statues!" - since it seems to express well the Lutheran tenet that Christ is truly present in the sacrament, which yet remains bread and wine also. Joshua: Consubstantiation, obviously, is one of the medieval theories devised to explain the sacramental presence of Christ, and one for which Luther (once, to my knowledge) expressed a mild preference -- if, that is, he were forced to choose among Scholastic theories. But he wasn't forced to do so, and so he left -- as our confessions of faith leave -- the philosophical details of the presence open for debate. Our point is simply to acknowledge the fact, rather than to declare the means. So we really don't hate the term at all; we just get frustrated that so many people impute it, wrongly, to our theology. And yes, we do sometimes get very frustrated! Fr. Hunwicke and Dix are both right, of course, in their description of what most protestants believe, which is attested in their lack of liturgy, lack of sacraments, lack of Saints, lack of images and relics, etc. Of course, it is risky to affirm anything at all regarding all protestants, as there are so any different kinds - from classical Lutheran to Calvinst, from Zwinglian to Evangelical, from Quakers to Unitarians, from Salvation Army to Jehovists. The last four are strictly not even Protestant - except inorigin- as they deny the Blessed Trinity. Luther's retention of a belief in the Real Presence in the Eucharist, and in efficacious Baptism, are Catholic relics which do not strictly conform to his own protestant theology of sola fide, sola scriptura. Sadly, modernday Catholic practise is much closer to Calvinism in liturgy, Zwinglian in sacramentology, and Arian in Christology. Which would make traditional Lutheranism actually more Catholic (in the shadows of Cahtolicism which it has maintained) than much of modern-day Roman Catholicism. Sad to say. "When the word says, 'This is My Body,' be convinced of it and believe it, and look at it with the eyes of the mind. For Christ did not give us something tangible, but even in His tangible things all is intellectual. So too with Baptism: the gift is bestowed through what is a tangible thing, water; but what is accomplished is intellectually perceived: the birth and the renewal. If you were incorporeal He would have given you those incorporeal gifts naked; but since the soul is intertwined with the body, He hands over to you in tangible things that which is perceived intellectually. How many now say, 'I wish I could see His shape, His appearance, His garments, His sandals.' Only look! You see Him! You touch Him! You eat Him!" -"Homilies on the Gospel of Matthew" [82,4] 370 A.D.
"I wish to add something that is plainly awe-inspiring, but do not be astonished or upset. This Sacrifice, no matter who offers it, be it Peter or Paul, is always the same as that which Christ gave His disciples and which priests now offer: The offering of today is in no way inferior to that which Christ offered, because it is not men who sanctify the offering of today; it is the same Christ who sanctified His own. For just as the words which God spoke are the very same as those which the priest now speaks, so too the oblation is the very same." Source: St. John Chrysostom, "Homilies on the Second Epistle to Timothy," 2,4, c. 397 A.D.
"It is not the power of man which makes what is put before us the Body and Blood of Christ, but the power of Christ Himself who was crucified for us. The priest standing there in the place of Christ says these words but their power and grace are from God. 'This is My Body,' he says, and these words transform what lies before him." "'The cup of blessing which we bless, is it not communion of the Blood of Christ?' Very trustworthily and awesomely does he say it. For what he is saying is this: 'What is in the cup is that which flowed from His side, and we partake of it.' He called it a cup of blessing because when we hold it in our hands that is how we praise Him in song, wondering and astonished at His indescribable Gift, blessing Him because of His having poured out this very Gift so that we might not remain in error, and not only for His having poured out It out, but also for His sharing It with all of us." -"Homilies on the First Letter to the Corinthians" [24,1] ca. 392 A.D.
"You perhaps say: 'My bread is usual.' But the bread is bread before the words of the sacraments; when consecration has been added, from bread it becomes the flesh of Christ. So let us confirm this, how it is possible that what is bread is the body of Christ. By what words, then, is the consecration and by whose expressions? By those of the Lord Jesus. For all the rest that are said in the preceding are said by the priest: praise to God, prayer is offered, there is a petition for the people, for kings, for the rest. When it comes to performing a venerable sacrament, then the priest uses not his own expressions, but he uses the expressions of Christ. 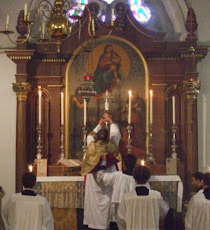 Thus the expression of Christ performs this sacrament." -"The Sacraments" Book 4, Ch.4:14. "Let us be assured that this is not what nature formed, but what the blessing consecrated, and that greater efficacy resides in the blessing than in nature, for by the blessing nature is changed… . Surely the word of Christ, which could make out of nothing that which did not exist, can change things already in existence into what they were not. For it is no less extraordinary to give things new natures than to change their natures… . Christ is in that Sacrament, because it is the Body of Christ; yet, it is not on that account corporeal food, but spiritual. Whence also His Apostle says of the type: `For our fathers ate spiritual food and drink spiritual drink.' [1 Cor. 10:2-4] For the body of God is a spiritual body." I could not disagree more I do not think you truly know what Lutherans believe and teach. For us, the doctrine of the real presence of our Savior's body and blood is absolutely CRUCIAL - and is in fact the beating heart of our entire theological system. And baptismal regeneration runs a close second. You note correctly that all Protestants are not to be lumped together and in that you are correct. Lutherans have images (my own parish has a statue of our Lord, two images of our Lord, an image of St. Paul, images of the four evangelists, and a crucifix upon the altar). We literally live from the weekly Eucharist. We are decidedly Lutheran in every particular, and not the least bit ashamed of it; but I as a Lutheran pastor have always and actively preached against the sort of nonsense that Dix described - Lutherans are NOT fideists. We do not believe we are saved by faith in faith; we believe, teach, and confess that we are saved by the mercy of God in Christ Jesus alone. It seems to me that what Dix is describing is not so much the original teaching of the Reformers or the official teaching of the communions that sprang from their work, as what is actually believed in the parishes. Albertus' description of many contemporary Catholics could as well be said of many contemporary Protestants. I recall, as a teenager, first visiting a Congregational Church for Sunday worship, and being struck by the lack of participation of the congregation; I thought to myself, "Is this not a church which would proclaim the 'priesthood of all believers'?" And yet, they didn't even pronounce an "Amen" at the end of the pastor's prayer. (One of those extemporaneous prayers that I was to find after a few more visits was pretty much the same week after week, and so not very extemporaneous at all.) "The Catholics," I thought, "certainly seem very much more to exercise a priesthood of all believers," not only, of course, via vocal participation, but also by consuming the sacrifice, something reserved to the priests of the Old Covenant. Most lay Protestants I have encountered have an idea that heaven is gained by living a good enough life; surely the Reformers would disagree, as would, of course, any Catholic theologian worth his salt. Evangelicals, both the Anglican sort and the American brand, seem to have little patience with the study of the Fathers, the Reformers or even, really, the Scriptures. Descended from the various "Awakenings" of the 18th and 19th centuries, their theology is as much a product of "felt faith" as is that of the Pentecostals. The Army does not have sacraments or "ordinances," of course. But they hold orthodox views on the Deity.